A lot of my sewing projects include hand embroidery. And the most common stitch I use is back stitch. It’s such a simple stitch to do, and it’s a great one to start with. Especially if you’re just beginning your hand stitching journey. 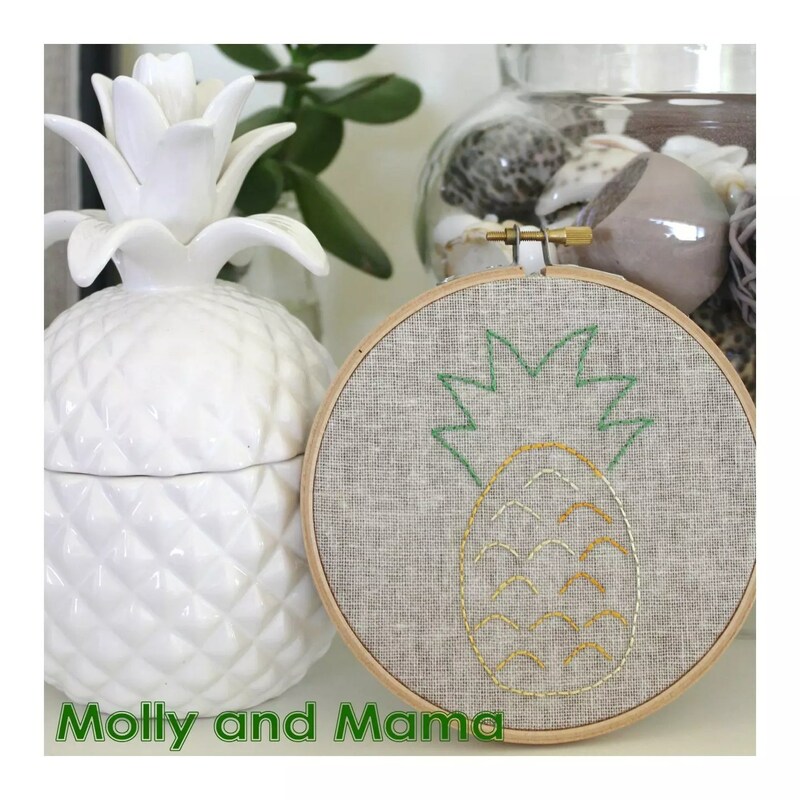 I recently stitched this lovely tropical inspired wall art. It’s created using nothing more than back stitch. I also transformed one of my five year old daughter’s sketches into a beautiful embroidery using back stitch too! I love it! I use six stranded skeins of embroidery floss (like DMC) for hand embroidery like back stitch. Depending on your project and how thick you would like your stitching to be, you can use all six threads or you can split them up. It’s not uncommon to stitch with three strands or two strands of floss also. In this project, I split my floss skein in half so I used three threads together. Some people like to pre-prepare their floss but I usually just cut a length of embroidery floss and then divide it as I need it. WILL YOU USE A HOOP? 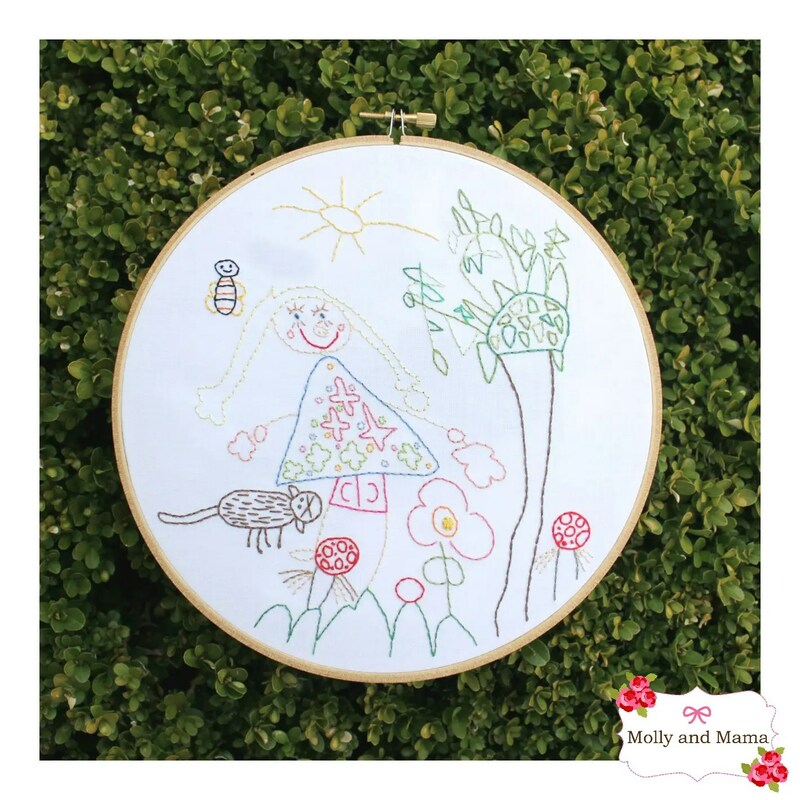 Before starting your stitching, consider using an embroidery hoop. They’re inexpensive and they help keep your project flat. This means you’ll have a similar thread tension throughout your project. You’ll avoid puckering and have a neater finish. I like the adjustable wooden hoops like the one shown below. You don’t need a hoop large enough to fit your whole project. You can just keep moving them around and readjusting their position on your fabric. Prepare your fabric by ensuring it is clean, ironed flat and has the edges prepared. As the fabric edges can fray during the hand stitching process, prepare the edges by overlocking (or serging) them, taping them with masking tape or cutting them with pinking shears (my preferred method). The method you choose will also depend on what you’re using your embroidered design for. If you’re creating a hoop art project, consider adding some weight to your fabric by adding some iron-on interfacing to the back. 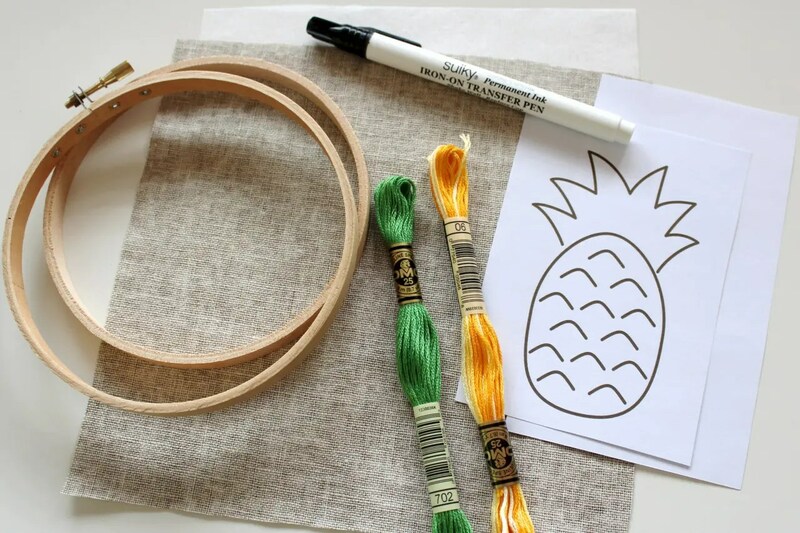 I did this for my pineapple embroidery project. It makes the fabric stiffer and easier to work with. To prepare a project for stitching, transfer your design onto your fabric. Your design may be a pattern, or a print out. You may also have a pre-made iron-on transfer. You can use a light box to help you trace your design with a lead pacer pen or erasable ink pen. You can also hold it up against a window to trace. You can draw the design on thin paper, and stitch through it. You can also draw your design on paper with a fabric transfer pen and then iron your design onto your fabric. Remember if you iron your design on, it will be a mirror image of the original though. So to start, cut a length of floss and split it in half. Your length should be long enough to easily work with. If it’s too short, you’ll be rethreading your needle constantly. If it’s too long, your project will be more susceptible to knotting and tangles. 15 to 20 inches is a good starting length (38 – 50cm). Thread the three strands onto your embroidery needle. Be sure to create a simple knot at the end and trim the excess thread past the knot (to 1/4 inch or less than 1cm). Consider where you’ll start your stitching and where you’ll finish. Try and work it so that your stitching will travel from line to line without too much overlapping and without travelling too great a distance on the back of the fabric. Will you stitch section by section or colour by colour? Take some time to consider this before you begin. You’re ready to start. When backstitching, you’re just making a series of normal straight stitches. But you stitch them in a backward motion. Bring the needle and thread up through the back (the wrong side) of your fabric so that the needle pops up a stitch ahead of your starting point or the beginning of your template. Stitch back to the starting point of your template. Make your stitch a 1/4 – 1/8 inch long (or a few millimetres long). This will be your first stitch. 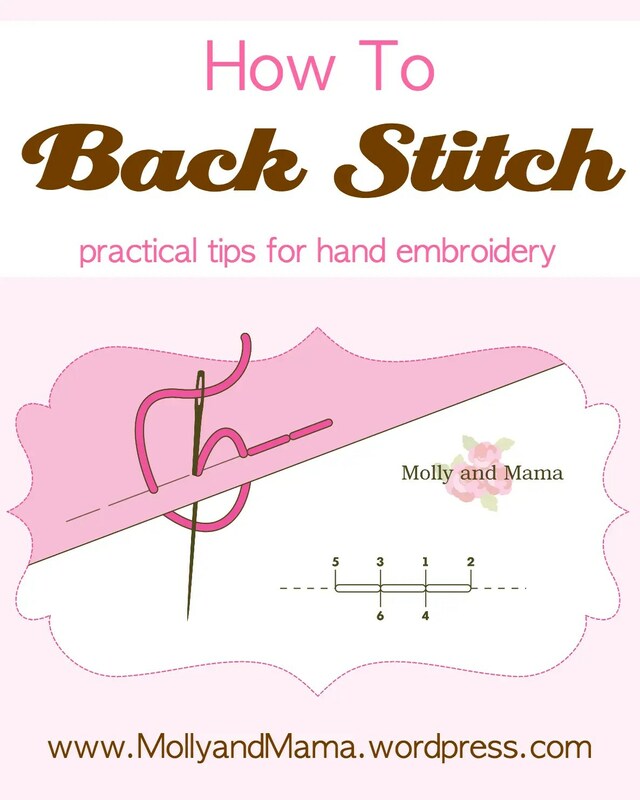 Then bring your needle and thread up a ‘stitch space’ ahead of your last stitch. Lastly, bring the needle down through the same hole as the end of the last stitch you made. This diagram may make things a little more clear. As you back stitch, be careful to cover the lines of your transfer as you go. Try and keep your stitches the same length. However, make adjustments as you stitch so that you don’t end up with one unusually short or long stitch at the beginning or end of a section or line. Consider the direction of stitching before you begin each new section, so you know exactly where you’re heading and where you’re ending. As you finish your thread, feed the needle down into the back and be careful to catch a number of your stitches to help secure the thread (you can see this in the image above, where the yellow thread is being drawn through a number of the stitches on the back to secure the thread). Trim the excess thread away. To start a new length of thread or to change colour, follow the previous instructions and continue stitching. This FREE tutorial features back stitch and explains how to transfer text onto a pillowcase using an iron-on transfer pen. It also goes though the process of back stitching. Back stitch is featured in most of my Applique Patterns too. You can browse the instant download range HERE. You can see how I’ve used it to stitch all the facial features below. 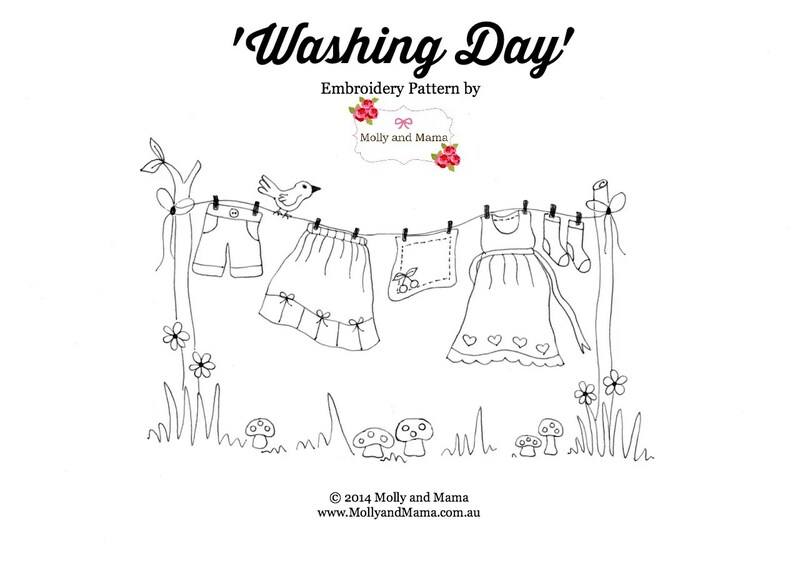 If you’re keen to create a backstitch project, you might like to use this FREE pattern I created for my Laundry Day post. You can download it HERE or Pin It for later. 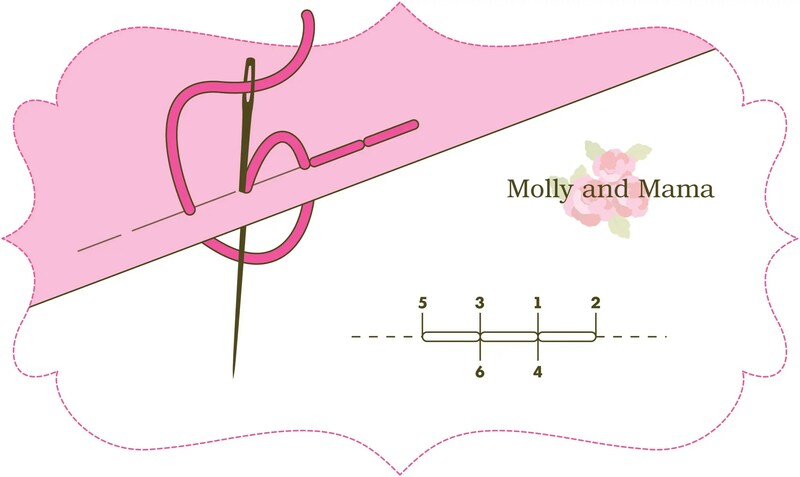 Thanks for being here for another Molly and Mama tutorial. You may have some terrific tips and ideas so please leave a comment. Or feel free to share your thoughts, and projects over on Facebook.